Rishad Tobaccowala, media guru, tells us we have entered the age of data driven marketing. Tom Davenport says it’s about competing on analytics. Gartner defines data driven marketing as…acquiring, analyzing and applying information about customer and consumer wants, needs, context, behavior and motivations. One concrete way of understanding this is by thinking through how differently advertising works in a programmatic vs. traditional ad world. Imagine a consumer comes to a website that creates an impression serving opportunity which the publisher will put out for real time bidding. Very limited information is passed along with the bid request other than some identifier. TOTALLY HYPOTHETICAL EXAMPLE (I DO NOT CURRENTLY WORK WITH EITHER COMPANY)…let’s say that this user prefers whitening toothpastes, is a male millennial, and is a social single. Now here is the first tectonic change in marketing…it is incumbent on the advertiser to know this…by building a database that contains this user’s ID and where this information has been attached because the publisher does NOT pass along this information into open exchanges. (Cookie syncing required but I won’t get into the tech stuff here). So let’s imagine that Procter knows all this about this user so an ad served to them for Crest 3D Whitening products is a valuable opportunity. Let’s say this same user is NOT in the Colgate database; then Colgate will know NONE of this! They will probably not bid on the impression, and Procter will win this opportunity that was just as valuable to Colgate if only they had the user in their database. If this happens over and over again because Procter has a more serious commitment to competing on data, the competitive advantage just from data-driven marketing becomes huge. Furthermore, the advantage can widen over time because whether or not that user responds to the ad can be added to their data profile. Why is this a tectonic change? Because in traditional advertising processes it was not the responsibility of the advertiser to know the audience. That was the responsibility of the media company to know their audience through their own research and syndicated research that was viewed as currency. All the advertiser needed to do was specify a target population, using demo based. With the rise of programmatic buying, it is becoming the ADVERTISER who must know and actually build their own audiences based on user knowledge and cherry picking the impressions they want to bid for. As a lifelong researcher, point 5 is particularly important to me so let me expand on that. In a digital age, it is market research’s responsibility to make sure that their marketers stay strategic at all times, while executing tactically on data to maximize the yield of marketing activities. It is the job of research to enable this magic trick. The three biggest areas needing reinvention are segmentation research, brand tracking, and new product testing. Segmentation research must be redesigned so that segments are created with digital profiling data as part of the analysis. If the segments are not findable for digital advertising they are not very actionable, and probably were beguiling but wrong in the first place as they cannot differentiate behaviors. In terms of brand tracking, there are two areas for reinvention. First, brand health cannot be completely captured by survey results. You need digital and social KPIs that reflect how much consumers choose to seek out your brand, which in turn, drives financial performance. I have urged my clients to stop referring to ”brand tracking”, and start thinking of it as “brand guidance” which is what marketing really needs. I was gratified that Coca-Cola, with whom I consulted, adopted this name change in redesigning their global “brand guidance system” and that others are now approaching me actually using this new terminology. When you think “guidance”, it will also focus you on the future. Predicting the next quarter is more important than reporting on the last quarter. Also, by matching digital and social profiling characteristics into survey respondents and analyzing which characteristics most differentiate those who are responding to your digital advertising you also get a new view into the soul of the brand in a way that will directly lead to adjusting ad targeting strategies for improved ROI. Volumetric concept testing is perhaps the biggest laggard of all. We think the forecast is the end goal. No, generating successful levels of trial is the goal! Research must create targeting strategies by creating what I call “Concept acceptors at scale” (CAAS) by appending digital, social, and shopper data profiling information to such testing so messages and offers can be precision-targeted. 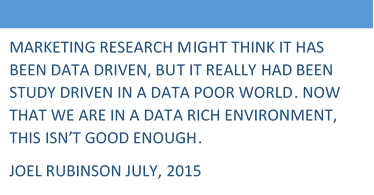 Market research might think it has always been data driven but it really has been study driven in a data poor world. Now, in a data rich environment being data driven takes on a whole new level of meaning that marketing research must understand if it is going to remain relevant. really joel, a name change from brand tracker to brand guidance makes a difference? Let’s face it, most brand trackers are a royal waste of time and money. Give me one example where a major marketing decision was based on a tracker? Most trackers tell you that it is dark outside, and you can as easily find out about that by just looking out of the window. Further, as bryon sharp observed most trackers are of correlational nature and confound independent variable with dependent variable, and so they measure that fat people on the average weigh more. Finally, most sellers of standard tracker rely on hubris and lies to sell their surveys. They claim that their tracker correlates with 5 times increase in sales relative to whatever, increase price premium and delivers leverage to guarantee the success of any brand extensions. Erich, I appreciate you continuing the discussion. The point is not the name change, it is the ASSOCIATED CONCEPT change. When someone says “brand tracker” what immediately comes to mind is a class of well known methodologies that are based on laborious surveys reporting on what already happened. It points the researcher to a set of usual suspects to do the research. the idea behind “brand guidance” is to bust up the cluster. What I want clients to think of is integrated data strategies, focused on prediction and changing media decisions in real time based on evidence.After Coca-Cola introduced their brand guidance system, I had three major marketers approach me to consult on their wish to create their own brand guidance system. When a client wants a brand tracker, they go to Millward-Brown or someone like that. When they want a brand guidance system they search elsewhere. It really is a big difference. Which I’m not sure too many people would agree with. The same is true with digital. It COULD be a useful input to your segmentation, just as demographics could be. But actually there are not that many circumstances where you would choose demographics or digital behaviour to drive your segmentation. Digital behaviour can be excellent for profiling and understanding needs-based segments. But the data is often patchy and social media data is really qualitative data on a quantitative scale. It’s not something you would necessarily attempt to build a complete view of the market with. Rather you would use it to add richness to your segments. We subscribe to the ‘horses for courses’ approach to segmentation. There’s no right or wrong way – you need to use the tools that will give you the best view for any particular company. Digital profiling could be key for an online retailer, but less so for a luxury bed manufacturer, for example. Thanks for a thought-provoking piece – it’s important to consider these things and our clients are certainly challenging us to incorporate digital behaviour and social media wherever possible. How much segments need to be driven by digital / social media behaviour is really down to the objectives of the segmentation (which is another topic altogether). I think we are nearly agreeing, but there is a semantic difference. It’s probably the word ‘must’ that I disagree with. Of course, it may well be a ‘consideration for acceptance’, but again it does rather depend on the circumstances and the client for whom you are segmenting. Of course we’d hope for demographic tendencies and, now, digital tendencies (and would usually design them into the solution). And we certainly aim to capture digital information where possible. The issue is that, in most categories, digital is nowhere near prevalent enough for it to be brought to the fore to such an extent (yet).